Fascinated by science and the impact of substances on the human body, Izabella decided to pursue a degree in pharmacy with a dream of one day finding a cure for a disease. An avid learner and goal-oriented student, she received the PharmD. Degree (Doctor of Pharmacy) from the Midwestern University Chicago College of Pharmacy at the age of 23. After graduation, she excelled at numerous roles including working as a community pharmacist, a clinical consulting pharmacist and later a medication safety pharmacist. She is a Fellow of the American Society of Consultant Pharmacists and holds certifications in Medication Therapy Management as well as Advanced Diabetes Care. After two years of researching Hashimoto’s and Hypothyroidism, she decided to combine emerging knowledge with her quality improvement expertise to run rapid tests of change on herself that led her to discover the root cause of her condition. She has summarized three years of research and two years of testing in her book: Hashimoto’s Thyroiditis: Lifestyle Interventions for Finding and Treating the Root Cause. 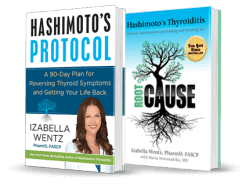 Learn about Dr. Wentz’ #1 NY Times bestselling book Hashimoto’s Protocol: A 90-Day Plan for Reversing Thyroid Symptoms and Getting Your Life Back. I didn’t want to give up. I thought that all my symptoms were somehow connected… There has got to be some lifestyle factors that contributed to this condition! There’s got to be ways I can make myself feel better! There has got to be ways I can help stop the progression… What can I do as a person with this condition to give myself the best possible life? I am a proud supporter of ThyroidChange because I believe that every thyroid patient should have access to proper diagnosis, appropriate medication management and education about lifestyle interventions! The TSH is not a reliable marker of thyroid function as it can fluctuate, especially in those with Hashimoto’s. TPO antibodies become elevated, years, sometimes decades before a change in TSH is seen and may be associated with fatigue, recurrent miscarriage, and many other issues before the TSH becomes affected. I believe that patients should be better optimized on their medications! Just because a TSH falls in the “normal” range does not mean the medication is dosed appropriately. We need to treat the patient, not the lab values! Patient symptoms are key! As a pharmacist, I can tell you that there are many medications that have pro-drugs that do not get converted to the active drugs in the body. T4, by definition, is a pro-drug, and does not always convert to T3! Sometimes combination medications are needed. Interventions such as eliminating infections, addressing nutrient depletions, reducing sensitizing foods and addressing adrenal function can help to improve symptoms, and even reduce or eliminate autoimmunity. It is my sincere hope, if you have suffered from fatigue, hair loss, brain fog, weight management, dry skin, depression, muscle aches, and the countless other symptoms, that your life will be changed for the better after implementing the research I’ve uncovered. It can help you do what most doctors and most clinicians would consider impossible, to put Hashimoto’s into remission!